With its eco-friendly style and performance that is perfect for any decor, Islander carbonized horizontal bamboo adds a designer touch of class to your home or office. Featuring a solid 3-ply construction for added strength and dimensional stability, the product may be installed on or above grade using nail/staple or glue-down installation techniques. Islander sources only Moso bamboo, it is recognized as a rapidly renewable resource by the United States Green Building Council (USGBC). Moso bamboo is twice as hard as domestic oak and is extremely durable and resistant to indentations. Coupled with a tough aluminum oxide finish, Islander horizontal bamboo flooring is rated for commercial and residential use. Maintenance is a snap using off the shelf cleaning products recommended for use with pre-finished floors. 30.66 sq. ft. per case and case weight: 63.9 lbs. Buy online Islander Carbonized Horizontal 9/16 in. Thick x 5 in. Wide x 40 in. 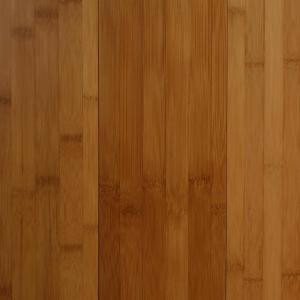 Length Solid Bamboo Flooring (30.66 sq. ft. / case) 10-1-007, leave review and share Your friends.